Technically, choking is only an injury, or medical emergency, if something is stuck in your throat. So the No. 1 women’s tennis player, Victoria Azarenka, on the verge of choking away her match Thursday, resorted to a cheap trick to beat American teen Sloane Stephens in the Australian Open semifinals. Azarenka faked an injury, and walked off the court for 10 minutes for treatment. She says the injury was real. I’m calling B.S. She simply took a 10-minute vacation in air conditioning, leaving Stephens alone on the court in a crucial moment … just … sitting there … waiting. The “injury’’ was supposedly for Azarenka’s chest and back, though she didn’t seem to remember that 15 minutes later, when asked after her 6-1, 6-4 victory why she had left the court. What a terrible look for women’s tennis in a rare big match not involving a Williams sister. REPORTING FROM WIMBLEDON, ENGLAND – A month ago, Serena Williams was crying on the court during her first-round loss at the French Open, looking old and devastated. A few days ago, her game still off, she was seeking advice from her sister, Venus, who talked about staying positive. 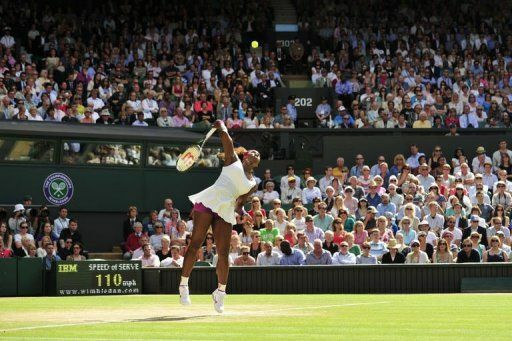 On Thursday, Serena was the greatest player in the world again, with a serve that is the greatest, most dominating shot the women’s game ever has seen. She beat No. 2-ranked Victoria Azarenka 6-3, 7-6 (6) to reach the final at Wimbledon. She’ll have to beat Agnieszka Radwanska on Saturday to win her fifth Wimbledon title. And it should happen. If there is any “should” anymore about Williams. Grunting has become the No. 1 pet peeve in tennis. The ringing in my ears has finally stopped from Victoria Azarenka’s win over Maria Sharapova last week, but that match still has fans riled up. Their grunting was sort of a tag-team thing, with one starting up at the exact moment the other stopped. And they were both outrageously loud.